The first thing I’d say about how to get media coverage for your business is that it is much easier than you may think. The next thing I’d say is that all media coverage for your business is not the same. If you are a small, local or solo business owner, the best practice, in my humble opinion, is to position yourself as the expert who helps your clients get the results that they desire most. And, your business is your vehicle. People want people they know, like and trust to help them. Media coverage is a great way to quickly and easily gain trust and likability. It’s also an opportunity to position yourself as the best and only choice for those you help. Media coverage for your business, then, is a consequence of getting media coverage for your self. Getting media coverage works differently today than it did a decade or so ago. In the past, you had to build relationships with journalists. Then send them your story and hoped that they had an interest or need to use your story. You could also have sent your story to hundreds of journalists and hoped that you got a bite. Either way it was extremely time-consuming, And hoping is a terrible business strategy. 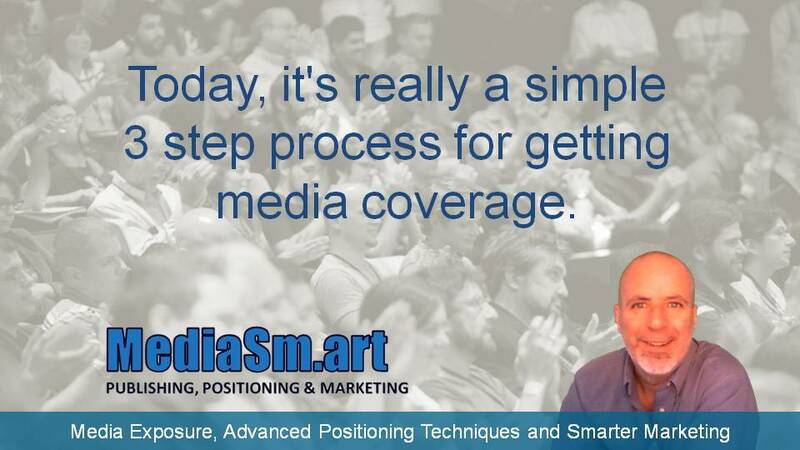 Today, it’s really a simple 3 step process for getting media coverage. Decide on the announcement, achievement, prediction, hero story or other angle for your news story. Remember, it must be newsworthy and that your story is a tremendous authority positioning opportunity. Write your news story as a press release. Follow best practices and format for writing a press release. A press release, news release or media release are basically all the same thing today. Distribute your press release news story through a press release distribution service like mine at MediaSm.art. Pricing varies depending on the amount of distribution and service you want. Of course you can do it yourself or use any media company. But why would you when advanced positioning is my specialty. And. we offer amazing pricing and superior personal service. When you get our best positioning service called Authority News Release, we identify and recommend your best positioning strategy during a phone call. Then we interview you to generate the best authority content to create your news story. It includes an authority quote from you. We write your press release and you approve it be fore distribution. Then we distribute it to hundreds of media outlets including those from national news media outlets (like ABC, CBS, NBC and Fox). We also distribute to radio stations, newspapers, Yahoo and Google News, other websites and to thousands of journalists. Now, that’s how to get media coverage for your business; or self. It’s really easy and there are so many benefits to getting media exposure. Most notably, is igniting organic opportunities for free media coverage. Read more posts to discover the many other benefits from leveraging media coverage with press releases for authority positioning. Or, simply visit MediaSm.art to get media coverage for your business; or self, today.